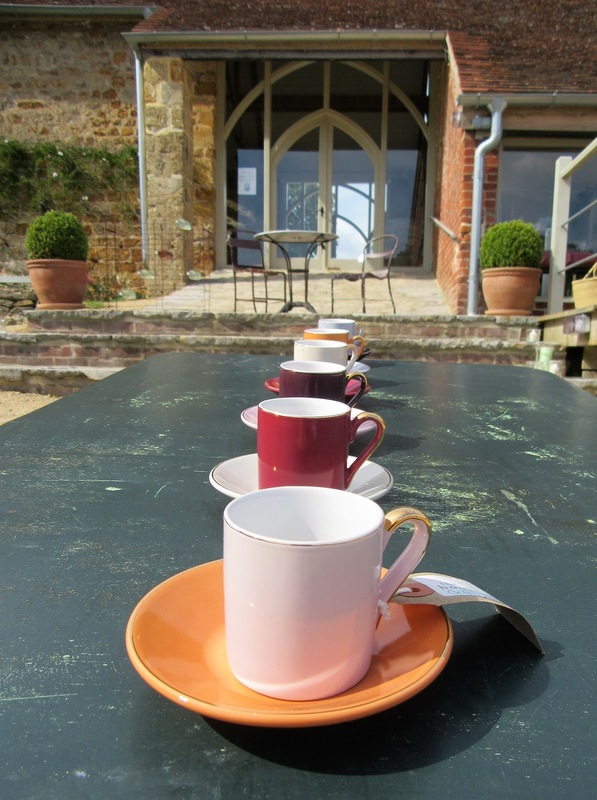 It currently feels as if summer has passed us by, so when the sun does shine we have started to make the most of it! 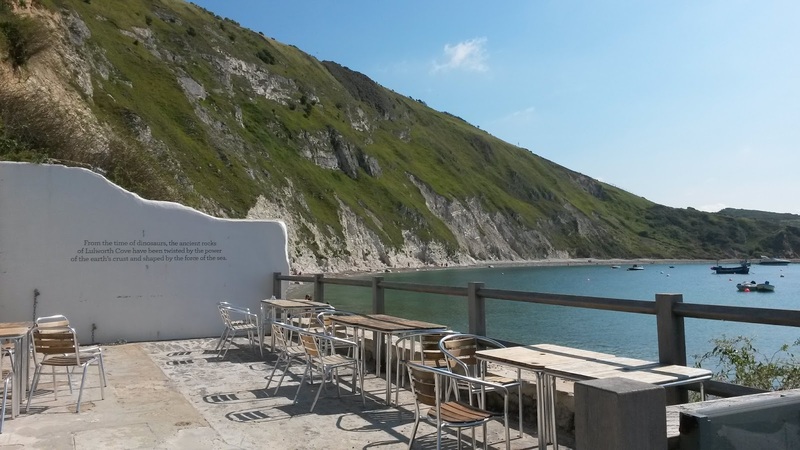 We recently revisited Lulworth Cove after a break of over 3 years, and were delighted to find a new cafe with a great area to sit and enjoy the view. From the time of the dinosaurs the ancient rocks of Lulworth Cove have been twisted by the Earth's crust and the power of the sea. The sea was so blue and the rock formations are always eye catching. As we were in the area we visited one of the garden centres that we used to frequently visit at Holme Gardens. 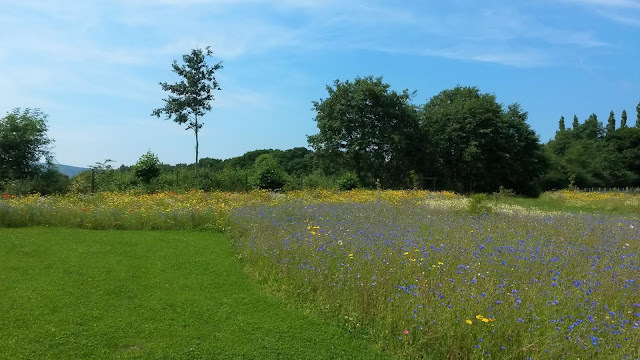 Again we were surprised to discover that they had converted some of their "pick your own" fields into a fantastic display garden that included this huge wild flower meadow. 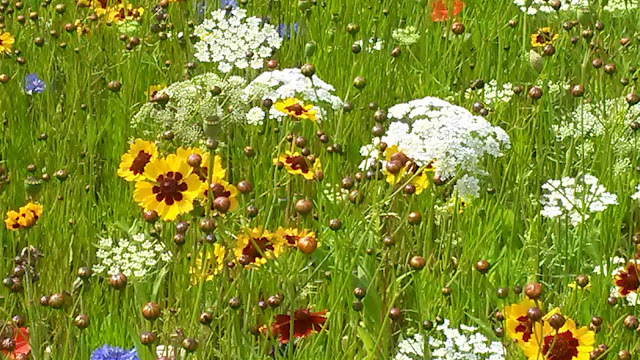 It was fantastic to see so many flowers massed together and there were so many insects enjoying it too! The weather seems to be so changeable at the moment. A six mile planned walk with friends turned into a visit to the pub instead, where we enjoyed warm comforting home cooked food. It felt more like October! The image above was taken at Sidmouth Folk Festival. It looks a fantastic day, but these blue skies had followed a very heavy downpour and those black clouds were still lurking close-by! The rain across the sea above didn't take long to reach the shore and it was a wet and muddy walk up to one of the marquees for our concert! While in Sidmouth we noticed this very unusual plant it is Agave tequilana and it has grown 30 foot (9 metres) in just a few weeks, we didn't realise it a the time, but the local TV station was filming a piece about see it here. The flowers do look wonderful close up! 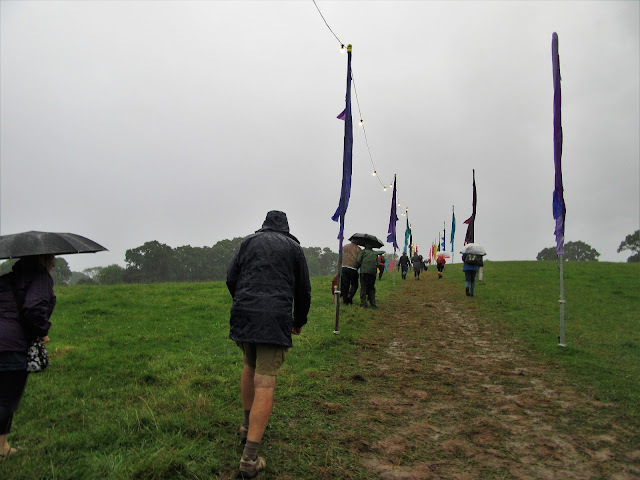 On another day after more heavy rain the skies cleared and we headed to the neighbouring village of Symondsbury , both of us slipped on a very muddy stretch on a steep down hill incline and we felt we needed a cup of tea to revive us. I enjoyed looking at the preparations for a French Collectibles Fair. I couldn't resist getting the camera out to photograph these items which were on display. Signs of autumn become more visible every day, the swallows are gathering on the telegraph lines, fungi is appearing in the fields, this week we picked our first blackberries and apples. Have you noticed any change in the seasons too? Lovely post, we have had days in the last couple of months where we have had up to three seasons in the one day. Most definitely. Autumn has come early. My hostas are already going a little brown around the edges, and the fuchsias are getting a little thin. The main thing I've noticed is the loss of daylight? Sigh...too soon! 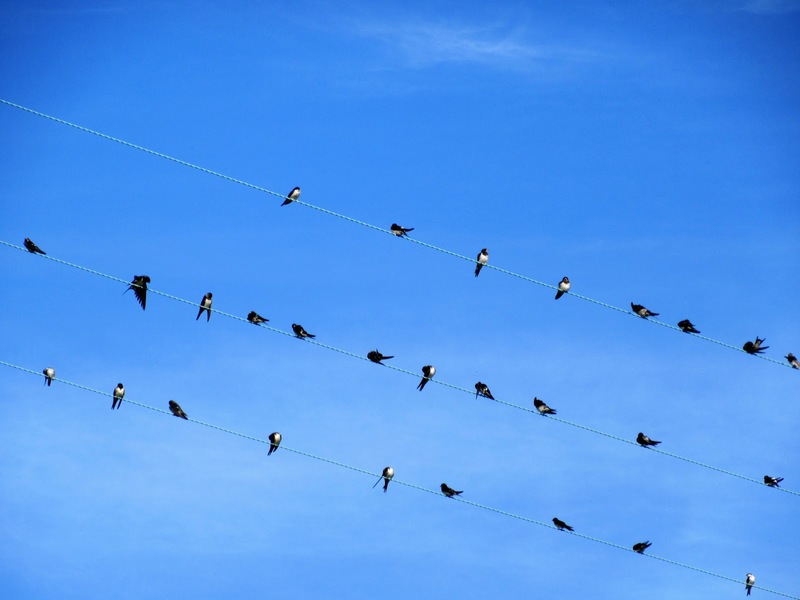 Lovely post and photos from around your place. The sea and sky looks amazing and great to see the field of wildflowers. Yes, a change of weather here - Spring is starting to show around here with a few pretty bulbs appearing. Yes Sarah. Even in Oklahoma, the weather is changing early. It isn't normal. Loved seeing your jaunt. 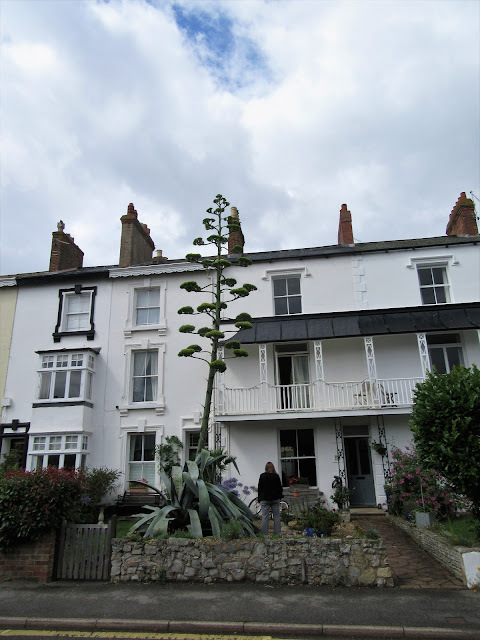 I think that agave rarely blooms. Love the wild flower meadow - I haven't noticed the swallows gathering, but that is an ominous sign that summer is drawing towards her end. Let's hope for an Indian Summer to take us into autumn. 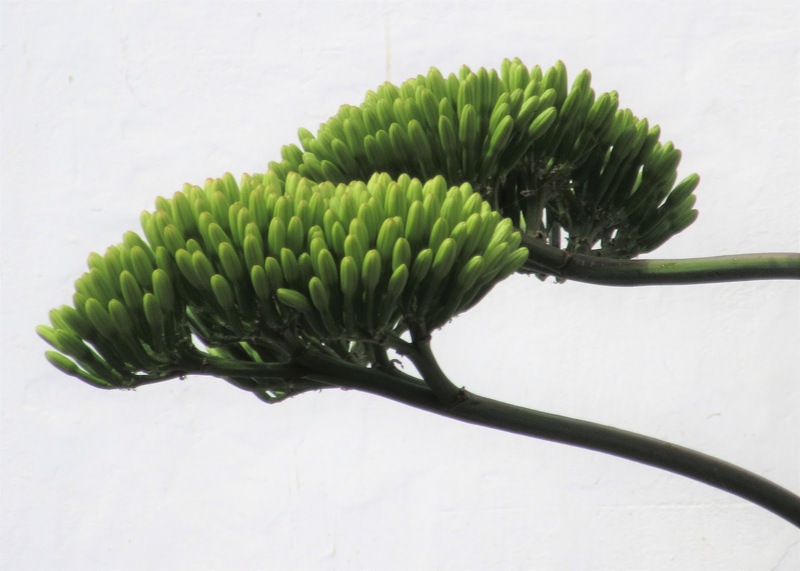 Sadly when an Agave tequilana flowers it dies. I had a beautiful succulent in the conservatory for many years which flowered last year. I was so excited about it, but then unhappily it died. Lovely to share your summer moments! That photo of the mushroom is incredible!!! What a gorgeous shot, that mushroom! OH SARAH, how I love your country. there is such a quaint beauty to land and sea and village and dale. Summer is almost over, what a pity. But as always, summer's sun burns the greatest memories into my life. ENJOY! We continue to have lovely summer weather, but there is that indescribable feeling in the air that fall is coming. It's all so beautiful! 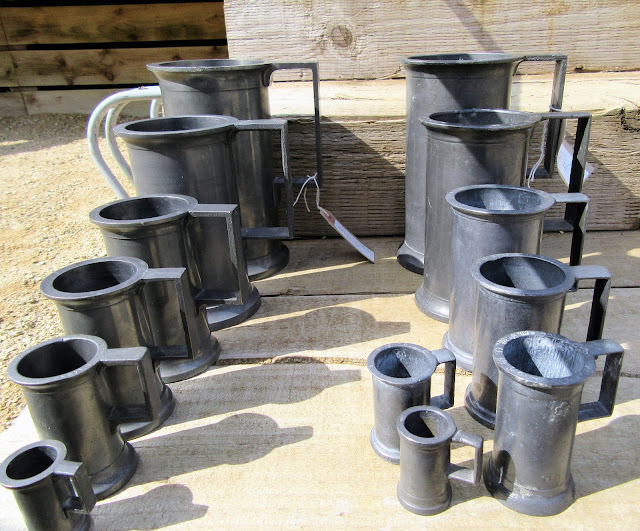 And I especially love the lineup of the French collectibles...wouldn't mind a few of those in my house! No, I am in total denial that fall is coming. Summer always seems much too short, although we do still have weeks and weeks ahead; but still, it is my favorite season despite the heat! Hi Sarah, it’s years since we were last in Lulworth but having read your post, I feel a visit coming on! It really does feel like autumn now. I was surprised to see so many hanging baskets almost over when I was out walking yesterday. It doesn’t feel like five minutes since they were planting them up. I enjoyed all your photographs, thanks for sharing them. Always lovely to see your pretty coastline ... Even the rainy parts! 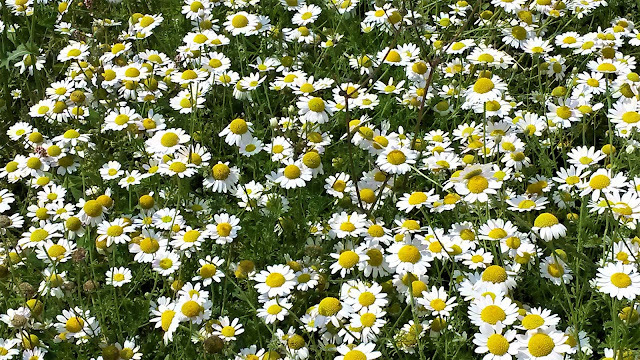 The wild flowers meadow is an inspiration... Spring is just beginning here, and I'm very tempted to try a spread of flowers like that. 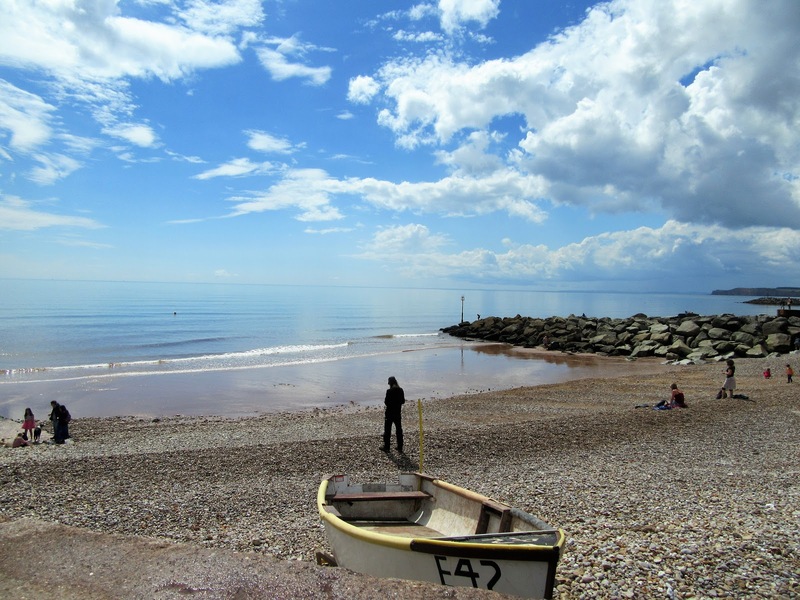 I remember that pebble beach at Sidmouth all too well as I had been swimming there and struggled to get out of the water as the pebbles rolled back with the waves and made it difficult to get a proper footing. Lovely photos of your day. Fabulous photos! Interesting video. 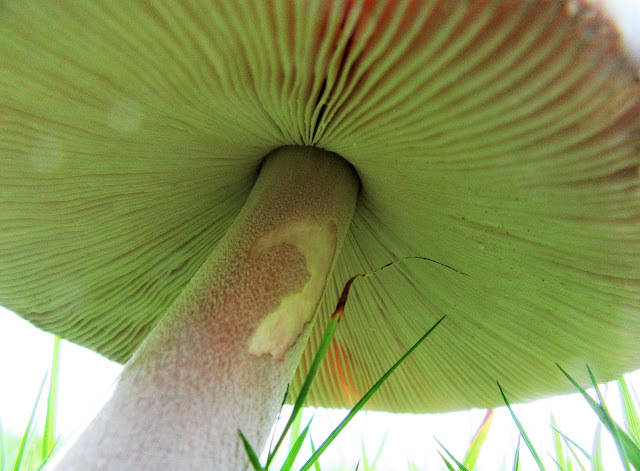 Great shot of the toad stool/mushroom. No signs of Autumn here yet. Yes I've definitely noticed a change! We're getting cold nights and misty mornings up here. Some of the leaves are changing colour too! I've never been to Lulworth Cove but it's somewhere I've wanted to visit for a very long time. Those wildflowers look fantastic! 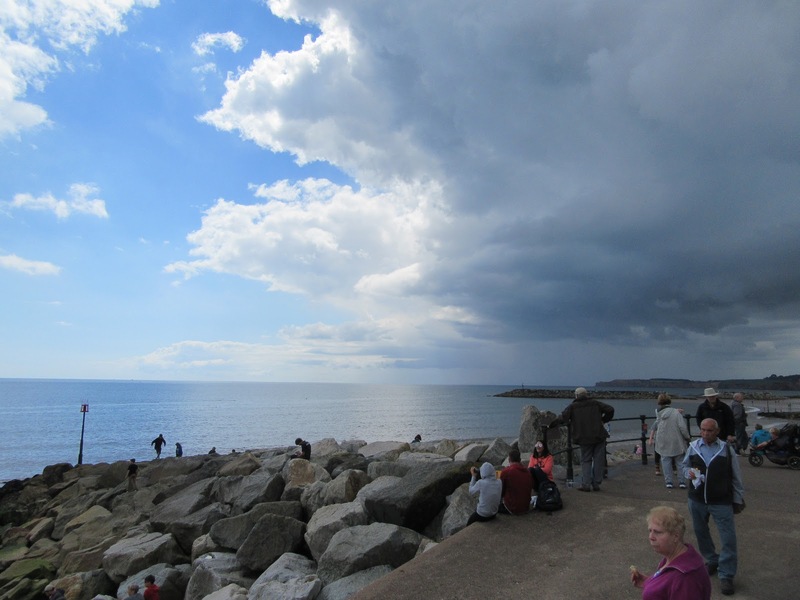 What a lovely set of photos and they really tell the story of an English summer - the weather! The middle of August and yet already it feels like autumn. 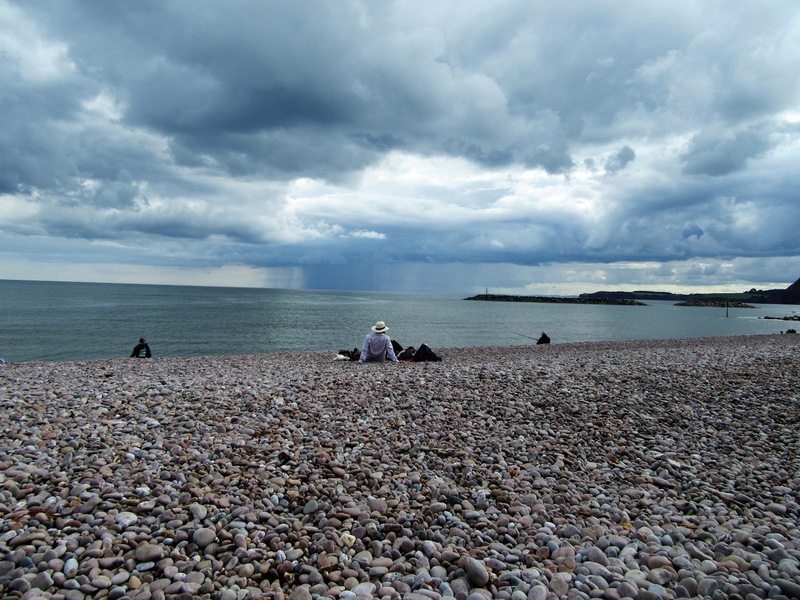 I love a visit to the seaside and Sidmouth is a favourite place, but not in the rain! Hi Sarah, your pictures are so lovely - and I agree with you, autum is in front of our doors. We have only three seasons, not four. This year was not normal, to much frost to the wrong time, a lot of rain and also not enaugh rain, and some days where to hot. I was at the seeside about this and hat 10 wonderful days there. Normal temperatures, 20 °,and I feel very well. At home we have such a sticky weather! A clear sign of Autumn here is the symphony of crickets all over. Yesterday we drove from Iowa to North Dakota and it rained relentlessly all the way home. It was an almost 8 hours drive. We must declare that the drought is over. Some of the corn fields in Iowa are ready for harvest and in here I see lots of wheat field already done. Your photos makes me want to visit there so much! Beautiful photos! Well, the summer went so fast and now we welcome the autumn! It´s ok! Hello! I'm linking from Art and Sand. I have two Westie babies named Finlay and Mustang Sally! I love your blog! Wonderful photos as ever - love that meadow! Wonderful photos. I visited Lulworth this year after a gap, used to sell ice creams down there summer of '64 The loos coukddo with an upgrade but wonderful that no development there, it really is my favourite place. Thanks for the tour. Sarah. It always surprises me that even a few wild flowers bring in many insects - must be a message in there somewhere!! Such lovely photos, Sarah. 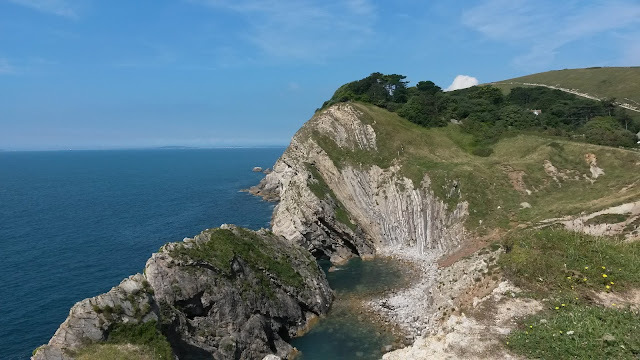 My wife and I spent our honeymoon in and around Lulworth Cove! Is your header photo West Bay? Autumn does seem to be approaching fast, the nights are drawing in, and I just can't believe we will soon be saying it's September. I hope you are having a nice Bank Holiday weekend. I see someone else mentioned that the agave dies after flowering. We had two large specimens for many years, and were excited when they flowered. Our gardener then told us that the plants would die, but fortunately each plant created new plantlets, so now we have more!